Thanksgiving is a time when we come together to celebrate with our family and friends over large portions of food. It may be difficult to not overeat whether or not you have type 2 diabetes. I believe that every person has access to a wise method for determining how much they should eat on a daily basis. And although you may be tempted, especially today, it is not natural for people to overeat. That being said, I also believe you can appropriately enjoy your Thanksgiving meal. Here I will share excerpts from my book, Diabetes: The Real Cause & The Right Cure. The Kindle version is only $0.99 in the month of November, in honor of National Diabetes Month. After reading this, I invite you to watch the short video that follows. Then download a copy of the book to discover the 8 steps that will help you change your eating habits and reverse type 2. Give yourself this gift this holiday season. And kindly share. You probably love food. It’s hard to resist a good meal. You may not have thought much about food as a collection of molecules containing the nutrients your cells need to function. You know, of course, that food provides your body with energy and vitamins and minerals, but what has been missing in your understanding is the impact of what you eat at the micro-level, where food breaks down into single molecules of energy nutrients and essential nutrients. You probably also never thought about your brain as a regulatory system that monitors and tracks your nutrient intake—using your taste sensors, smell receptors, the sensations in your mouth, the hormones in your stomach and intestines, and the levels of glucose and nutrients in your blood as it flows through the brain. So if these sophisticated mechanisms have developed in humans, why do so many people overeat? Why doesn’t the brain help us completely regulate our sensations of hunger and satisfaction such that we never gain weight, never consume too much food that floods our bloodstream with glucose, and never develop high blood sugar. From a biological standpoint, the human body was not constructed to overeat on a consistent basis and gain excess weight to the point of causing high blood sugar and diabetes. The body doesn’t need to store more than a small amount of fat. The purpose of our digestive system and fat cells is to capture nutrients might need on an immediate “just-in-time” basis. Similarly, the brain’s regulatory system was designed to produce feelings of satisfaction and pleasure when we consume food that supplies our body with the nutrients it needs. 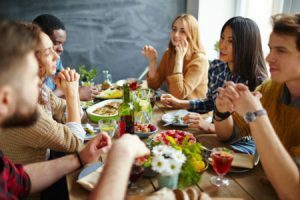 What is happening to humans in much of the world today is an exposure to an endless quantity and variety of foods that activate our excitement and pleasure. It is biologically natural to feel a desire to eat these foods. But as we begin eating too much of those foods, as well as too much of the wrong foods that are mass produced in our industrial food complex—e.g., grain-based carbohydrates with added sugars, fats, and salt—we reinforce behaviors that repeatedly trigger the pleasure system of the brain. We thus begin overeating regularly because it induces these pleasurable feelings. We are then no longer content to feel the enjoyment that comes with eating enough to feel just satisfied relative to your true hunger. Evidence of this “food bonanza” abounds in societies where high blood sugar and diabetes are rapidly increasing. Restaurants continue to serve extremely large portions of carbohydrate-based foods compared to the amount a normal human needs for nutrition in a single meal. Some restaurants even make an entire business out of offering people expansive “all you can eat” specials, as if to challenge them to overeat until they are bloated and sick. Sugared drinks and food products packed with carbohydrates and salt are packaged and marketed in ways to make us associate them with happiness, sexuality, success, and good times. 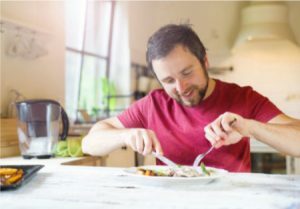 Even when people cook at home, they have trained themselves through habit to serve large portions and eat everything on their plate regardless of the signals they may receive from their mouth. In addition, they take pride in showing who can provide the most variety of foods to entertain family and friends. People in many societies, not just the US, are losing control of the natural human mechanisms to eat healthy and enjoy their food. 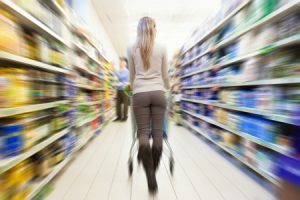 We are succumbing to powerful external forces that are motivated by profit—the food industry and marketers of food products. Diabetes existed only as a rare human condition for thousands of years, a biological phenomenon based on bodily chemistry. However, with weight gain affecting an estimated one-third of the entire global population, it is clear that factors outside of normal human biological phenomena are driving epidemic levels of diabetes. Nothing short of a revolutionary approach can reverse this epidemic. Is it possible to regain control of your eating habits? Fortunately, the answer is yes. It is obvious that if you have been diagnosed as diabetic, you have not yet understood on a deep level how to control your eating behaviors. Many of you may feel skeptical about trying yet another approach if you have experienced failures with other “lifestyle changing” attempts. Whatever your reaction, I want to help you feel confident that you can regain control of your eating habits. Think about this: how can anyone else tell you what to eat on a daily basis if you yourself can’t know which nutrients or how much of each your body needs when you start eating? In other words, your own brain is the only location with the precise information of your body’s needs. You must begin paying attention to and listening to your hunger signals. The desire to acquire nutrients—the hunger sensation—is present in all living things. How you respond to this natural signal will determine whether you are accumulating fat or not. Just as your brain can evaluate your surroundings and warn you of danger, or listen closely to a symphony and pick out the piccolo part, or feel an itch in your lower back when you are giving a speech to an audience, it can detect the nutrient needs of every cell in your body and determine what foods you need to consume to provide those nutrients. Just as the brain detects an insufficiency of water in cells and bodily fluids and tells you that you are thirsty, it signals you to feel hunger when it detects that other needed nutrients are about to fall below optimum levels. The implications of listening to your brain’s signals about hunger are important if you truly want to change your eating habits.